As the debate rages on about ride-sharing services such as Uber and Lyft operating at U.S. airports, another alternative ground transportation method is quietly spreading throughout the industry: car-sharing services. Zipcar is an increasingly popular brand of car-sharing service with about 10,000 vehicles around the country, including small inventories at more than 50 U.S. airports. In April, the company announced it was adding seven new airport locations: Augusta Regional Airport in Georgia; Griffiss International Airport in Rome, NY; California's Monterey Regional Airport; Newport News/Williamsburg International Airport in Virginia; Florida's Orlando International and Tampa International; and Tri-State Airport in West Virginia. To rent from Zipcar, customers pay a one-time $25 setup charge and recurring annual membership fees of at least $70 per year. Non-airport rental rates begin at $9 per hour or $49 per day and include insurance, fuel and variable mileage allotments. Rental Model: Customers pay a one-time setup charge & recurring annual membership fee to rent vehicles by the hour or day; rates include insurance, fuel & variable mileage allotments. The company prides itself in providing vehicles that are economical and efficient to operate and rent. At Dallas/Fort Worth International (DFW), for instance, the company offers five vehicles: a Jeep Patriot, Jeep Compass, Volkswagen Golf, Ford Focus and Toyota Corolla. Rates at DFW begin at $9 per hour or $80 per day. Zipcar also rents to 21-year-olds, while many traditional agencies require drivers to be 25 to rent their cars. The company was launched about a decade ago by two Massachusetts residents who wanted to bring the European car-sharing model across the pond to North America. (It also operates in France, Spain, Austria and the United Kingdom.) Avis Budget Group then purchased Zipcar in March 2013 for about $500 million in cash. Operating as a subsidiary of the established car rental giant has likely eased the company's entry into the airport market. "Zipcar makes it easier than ever to live without owning a car, and that includes providing a simple and convenient way to get around when you travel by air," Zipcar President Kaye Ceille said in a written statement. "Whether you are in town for a short business trip, or you're stuck at an airport for a long layover, Zipcar offers the flexibility and freedom to explore the surrounding area on your time and in your way." Zipcar officials aren't the only ones who are optimistic about how its services can benefit airport customers. Jennifer Hickerson, marketing and public relations coordinator at Monterey Regional Airport (MRY), fully expects the car-sharing option to appeal to passengers at the coastal Californian facility - especially those arriving on nighttime flights. "Zipcars will make it easy for those passengers who don't want to stop at a counter when they arrive," explains Hickerson. "They simply use the app to reserve, pay and unlock the car. This is very beneficial to those who arrive late in the evening (because) some of our rental cars close before the last flight arrives." The brand should be a particularly good match for the airport's smartphone-centric travelers. 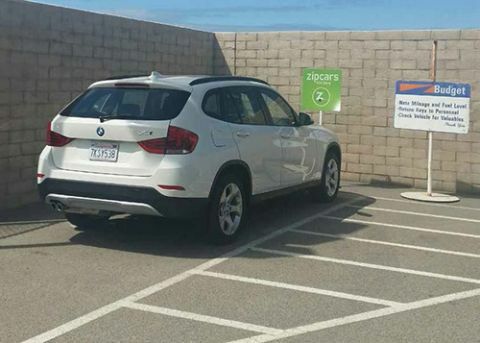 "Zipcars allows MRY to cater to a more technology-advanced passenger," she elaborates. "Many of our visitors from large cities are used to this type of vendor. I think they will be pleasantly surprised to find it in Monterey." That said, Hickerson still sees a place for the airport's more traditional providers. "Some passengers like the experience they receive from a rental car agent, and other passengers are more of a 'do-it-yourself' customer," she says. "This will allow the passengers who don't need the extra service traditional rental car agencies provide to just help themselves." Jerry Brienza, the director at Tri-State Airport (HTS) in Huntington, WV, also welcomes the chance to offer passengers a new ground transportation alternative. "We allowed Avis to begin the Zipcar program at our airport because it was simply another option for our customers to experience," says Brienza. "As far as I know, HTS is the only location in the state of West Virginia to have a Zipcar; so we were delighted to have this amenity available." While Brienza expects some travelers to choose HTS' new ground transportation concessionaire, only time will tell how Zipcar performs in a smaller market like Huntington. In early June, the airport hadn't received much feedback about the recently added rental option; but Brienza was optimistic about seeing positive results later this summer, as Zipcar was just beginning to ramp up its local marketing efforts. Zipcar largely targets its marketing appeals at Millennials, the children of Generation Xers who were born between the early 1980s and the early 2000s. Officials at Newport News/Williamsburg International Airport (PHF) are confident that the Millennial segment of their customer base will patronize the Virginia airport's new concessionaire. "With Millennials on the rise, and travel a top priority among them, I can see Zipcar becoming a very popular choice," says Jessica A. Wharton, the airport's director of marketing and public affairs. Zipcar's booking and checkout model dovetails with the rise in passengers booking travel online and using smartphones to check in for their flights. The company also emphasizes the importance of saving money, self-service convenience and the beauty of on-demand transportation - all attributes many travelers seek in their flying experiences. "We are all for service that lets our passengers choose their own level of convenience, while also offering a great product," Wharton remarks. " I hope to see Zipcar, as well as other new travel trends, emerge and be successful at PHF." Drafting off Zipcar's progress in changing the way that people think about alternative transportation, several competitors have emerged: Hertz on Demand, Enterprise CarShare, Uhaul Car Share and Daimler's Car2Go. However, Zipcar still lays claim to being the largest car-sharing service in the world and appears to have a significant lead in the airport segment. A tagline on the company's website succinctly summarizes its appeal to airport customers: "You can go from the aisle seat to the driver's seat without slowing down."